Backed by a team of hardworking and qualified professionals, we are committed towards providing high grade Printed Tag. The tag offered by us is used in various items like garments, fashion accessories, shoes, clothing and other items. 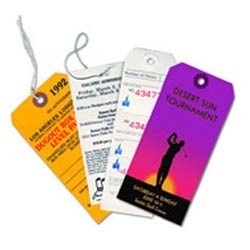 Our provided tag is designed and printed under the supervision of our skillful professionals with the aid of qualitative ink and paper with leading machinery. To deliver excellent quality tag at clients’ end, we firmly test this tag on numerous quality parameters. We “Ashish Printers” are actively committed towards Printing and Designing qualitative Book, Calendar, Booklet, Brochure, Manual, Catalog, Leaflet, Tag, Dangler, etc. These products are printed and designed under the directions of our skilled professionals with the help of premium quality ink, paper and the latest technology. Our offered products are well known among our clients due to the excellent design, clear printing, fine quality paper and smooth finish. Keeping in mind the different needs of the clients, we provide these products in customized solution. We believe in offering innovative print solutions with good price-performance ratio. We take on the role of consultants to our clientele to find out the job to meet their needs & are cost effective. We enjoy transforming the vision of the clients into the final product, and have the experience to make it happen, whether in press, or printing of finishing options. We also provide Printing Service, Graphic Designing Service, Book Binding Service, etc. We have a team of skilled professionals who impart these services after closely interaction with the clients.